Cue Manager ('Cueman') is a software application for the Mac OS-X operating systems which allows the register contents of the Lance Design TDC-100 to be downloaded from the TDC-100 to a Mac and saved to a file, and to be uploaded from a file back into the TDC-100. This allows you to store the contents of the TDC registers off-line, and to restore them quickly and accurately when you go to the next truck or show. CueMan also allows menu settings to be stored and recalled. Download Cueman for Mac using the download button or the menu. There is also a prototype (blank) Excel spreadsheet and information about hardware interfacing available in the menu. The current version of Cueman for Mac is a 64-bit application, which is suitable for all recent versions of OS X. If you need the older 32-bit version, it's available HERE. 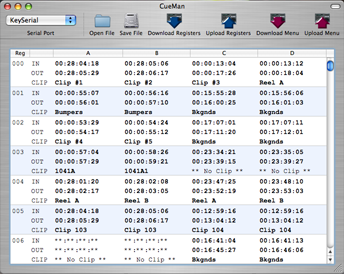 A Windows version of Cueman is also available.